German settlers first came to what is now North Carolina as part of the second expedition sent to the Roanoke area by Sir Walter Raleigh in the 1580s. The largest influx of German people to North Carolina, however, occurred in the eighteenth century, beginning with a joint effort between a Swiss land company and the British Crown to settle 100 families of German Palatines in the town of New Bern on the Neuse and Trent Rivers in 1710. The colony flourished and prospered for 18 months, but in 1711 the colony was virtually destroyed after suffering an attack by Tuscarora Indians. Despite such setbacks, German settlers continued to come to North Carolina throughout the eighteenth century. As unoccupied land became harder to find in the populous Pennsylvania region where they had originally settled, many Germans migrated south and settled mainly in the backcountry, or modern-day Piedmont, of North Carolina, the first arriving in the colony by 1747. Because they were migrating from Pennsylvania and because their own word meaning German-"Deutsch"-was not translated very well by English settlers, the newcomers into North Carolina were sometimes termed the "Pennsylvania Dutch." There were four primary religious groups among these people: German Protestants, Lutherans, German Reformed, and Moravians. Because of language and cultural barriers, the Germans kept mainly to themselves, and many continued to speak German even into the mid-1800s. Most of the Germans were farmers who settled near lakes and streams, where the land allowed them to produce successful crops as well as to keep livestock. Because the region was sparsely populated during that era, land was plentiful; farmers could take fresh land each year instead of refertilizing farmed land, a practice that increased the size of farms but also caused damage to forest lands. Most German families lived in traditional pioneer cabins built of logs and consisting of one large room with a smaller loft above. Later, as the colonists became more prosperous and better adjusted, these cabins were replaced with wooden and stone houses. Some of North Carolina's German settlers, in particular the Moravians, held different views of society from most of their neighbors. According to meticulous records still preserved today, the Moravians arrived in 1753 to settle a piece of land-the Wachovia Tract in what is now Forsyth County-acquired from Earl Granville. All of the land was owned and controlled by the church for use by all residents. Land for homes, farms, and businesses was used by individuals but belonged to the community. The settlement was self-sufficient, and all residents and visitors were welcomed, served, and honored without respect to race or creed. 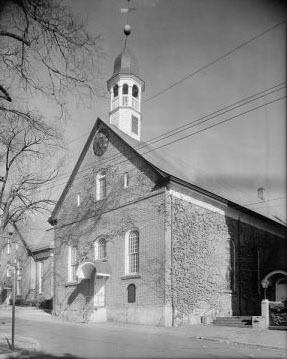 Because their religion condemned the use of military force, the Moravians remained neutral during the Revolutionary War, paying rent to their British landlord Granville as well as taxes to the newly formed U.S. government. Although the language barrier kept many German settlers relatively isolated from other settlers for their first few decades in North Carolina, the barrier eventually fell away and Germans actively joined the greater society. Until this breakthrough occurred, most Germans found careers in either the schools or churches of their community. Once the language barrier disappeared, however, they were able to find careers in all areas of society. People of German descent participated in the Civil War primarily as common soldiers. Though some Germans did own slaves, most worked their own land and felt removed from the slavery issue. Nonetheless, many Germans did fight and die in the nation's bloody conflict. Although the German population eventually blended into a common North Carolina culture, German influences have had an important impact in the state that continues even today. The religious influences of Germans are notable, for example, and the Moravian village of Old Salem remains as a reflection of their impact. Education is another arena in which North Carolina's German settlers left their mark, establishing Catawba College in Newton in 1851, the Western Carolina Male Academy (which became North Carolina College) in 1852 in Mount Pleasant, and the Mont Amoena Female Seminary in Cabarrus County in 1859. Carl Hammer Jr., Rhinelanders on the Yadkin (1965). Hugh T. Lefler and Albert Ray Newsome, North Carolina: The History of a Southern State (1963). A Condensed History of the Early Settlers of Catawba County, Prepared by Colonel George M. Yoder, Catawba County Library. Low's Lutheran Church, NC Historical Marker J-61, North Carolina Office of Archives & History. Grace or Lower Stone Church, NC Historical Marker L-45, North Carolina Office of Archives & History. Old Stone House, NC Historical Marker L-60, North Carolina Office of Archives & History. Samuel Suther, NC Historical Marker L-76, North Carolina Office of Archives & History. Old Brick Church, NC Historical Marker J-57, North Carolina Office of Archives & History. Home Moravian Church, built 1800, previously called the Gemein Haus in Old Salem, now Winston-Salem. Created by Johnston, Frances Benjamin, 1864-1952, photographer; and published between 1935 and 1938. Image courtesy of Library of Congress, call #: LC-J7-NC- 2457. Available from http://www.loc.gov/pictures/item/csas200802700/ (accessed August 14, 2012). What a good website. I'm brazilian and I'm just here reading your topics because I love History and by the fact that there are information not provided in my language (portuguese). I read a lot about Native history, European settlement and colonization, etc. Thanks for providing us with this knowledge. Hello there! I am researching my family history and came upon the name of Jacob Barks. According to some information from the book (which I unfortunately cannot get a hold of) German Speaking Peoples West of the Catawba, North Carolina, he was born in 1771 in Lincoln County and he was granted land for his father's service in the Revolutionary War. He was one of the first to settle near my hometown in Missouri. Right now, information I have for him lists him possibly being the son of a William Barrick of Germany/Maryland, but I don't know how accurate this information is. I also did not see a Barks in the ancestor search at the Daughters of the American Revolution website, though there were a couple Barricks who do not match up with his alleged father. So I've kind of hit a dead end, and any information I can find about him would be great. Again, he is Jacob Barks, born 1771 in Lincoln County, NC, allegedly the son of a William Barks/Barrick/Berg and Catherine Reinhardt - married Hannah Masters who was born 1783 in Lincoln County, NC daughter of Nicholas Masters and Elizabeth Clubb. Molly, have you received any information about the William Barks you referenced in your post? I am a descendent of Jacob and have researched the Barks of Bollinger County for more than 40 years. I have some information about William in Lincoln County N.C., but it is pretty limited. I am looking for more information on the Laugenaur/ Swaim family who settled in Wachovia or known as Salem but in the 1700’s. Laugenaur is spelled differently everywhere I’ve looked. Geourge Laugenaur is the one I’m looking for if I’m not mistaking. I am looking for information on a German immagrante by the name of phillipee dezern. do you have information on that? Thank you for your question on our NCpedia site. Regarding Mr. Dezern: have you got any additional information you can share that would help in a search for him: birth date, county/state he lived in, immediate descendants or ancestors?